I perform museum-quality conservation and restoration of antique furniture, tall clocks and other artifacts, and make reproductions of period pieces. I also buy and sell clocks and antiques. Much of the conservation work involves major repairs or refinishing of period furniture while preserving as much of the patina as possible. Additions or alterations to antique pieces are carefully researched in order to assure authenticity. Conservation is a collection of before & after photos of my conservation work. Clock Conservation is before & after photos of some of my clock work. Reproductions shows a few of my recreations of period pieces. C C Tall Clocks shows my photos of the tall clocks that were in the exhibit I curated at the Cumberland County Historical Society in 2005. 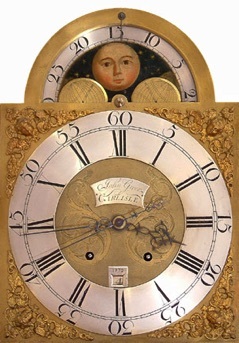 John Greer, Carlisle's earliest known clockmaker, made this dial in 1772. The clock is now in the museum of the Cumberland County Historical Society. 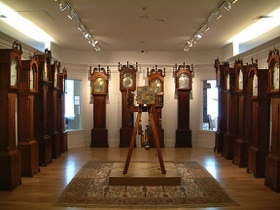 Click above to see photos of the exhibit of Cumberland County tall clocks that I curated for the CCHS in 2005, and an essay about tall clocks that I wrote for the show. I began working full time with my Father William S. Bowers in 1975 after graduating from Dickinson College and three years of studying and teaching speculative philosophy at Boston College. My Father's career in conservation began in the 1930's as a sideline to his employment as a patternmaker and several years working for Wallace Nutting. As an apprentice to him and as a partner until his passing in 1991, I was able to acquire a broad range of experience with period furniture and develop my technical skills.